Jumblies is a Toronto-based organization with a national and international reach that engages in collaborations between professional artists and diverse people and communities, and equips, mentors and supports others to do so. 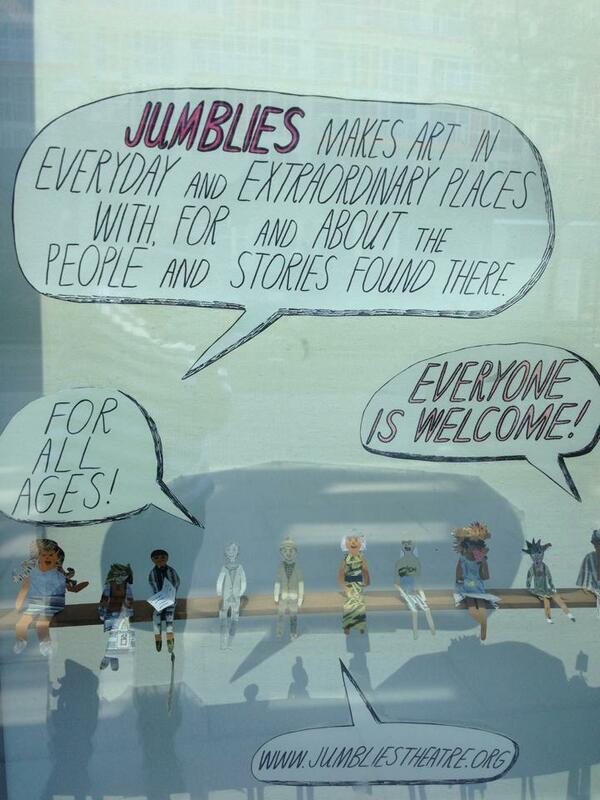 Jumblies expands where art happens, who gets to be part of it, what form it takes and which stories it tells. This imperative has led us outside of specialized art places, and to place participation and radical inclusion at the core of our projects. We say Everyone is welcome! and embrace the joys and challenges, social and aesthetic, of meaning or trying to mean it. We adapt, combine and play with forms of arts production placed in new situations, with equal attention to all stages (before, during, after). Our performances and presentations, albeit highly-produced, are steps in a process, the ultimate product of which is the transformational experience, and its memory and trace – the transient micro-utopia and its lasting ripples. Jumblies at Large,initiating and pursuing new partnerships and collaborations with other professional arts organizations in order to infiltrate community arts practices and perspectives into the cultural “mainstream”. 2000-01 Lawrence Heights I’m Tapingi Too! As well, Jumblies has engaged in workshops, touring and collaborative projects across Ontario and Canada. 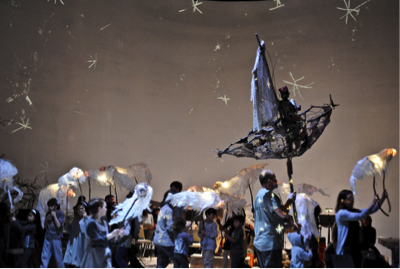 In Spring 2015, we were the main producer of Train of Thought, the outcome of 3 years of collaborations with cross-country partners: a west-to-east-coast tour of community arts and (re)conciliation, with 25 stops, 75 travellers, 95 partners, hundreds of participants along the way and many new relationships and legacy projects. 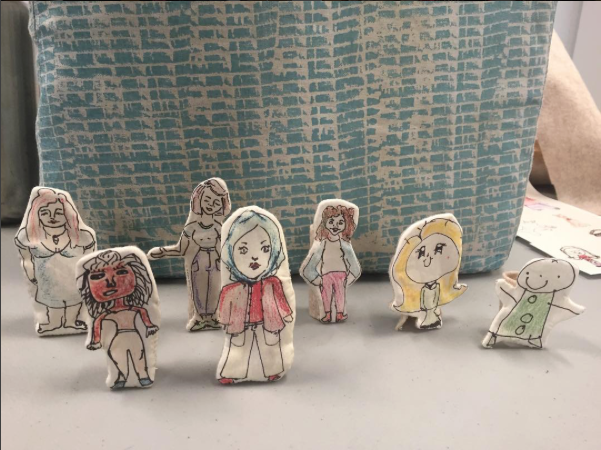 Our second touring project Four Lands took place from 2016 to 2018, and visited many urban and rural locations from coast to coast, ending with a 7-week residency at the Art Gallery of Mississauga in 2018. In January 2014, Jumblies moved to a new downtown home-base, which we call The Ground Floor, in a Toronto Community Housing block in new highrise neighbourhood called CityPlace. From here we have continued to engage in local and Toronto-wide projects; mentor and support artists, projects and organizations; and offer workshops, consultancy and collaborations across Toronto, Ontario and Canada. From The Ground Floor, we created a suite of interlocking projects to explore the buried landscapes and Indigenous histories in this location and the city at large, including Talking Treaties, City Place Chronicles, Soft City Place, Under the Concrete, What Was My Back Yard? The View From Here and more. Many of these new works were presented in our two-month-multi-site Touching Ground Festival in May and June 2017. In 2018-19 we are attending to the legacy of Touching Ground (including remounting Talking Treaties in October 2018), as well as launching new partnerships, themes and creative threads.